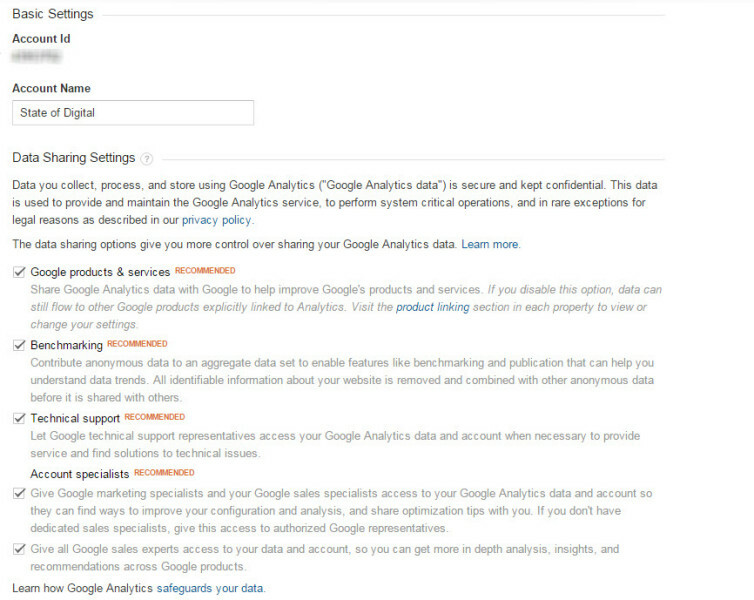 Google Analytics Settings: Are You Setup Correctly? Google Analytics Settings: Is Your Setup Correct? Up until recently, I hadn’t really paid a huge amount of attention to all the different settings available to advertisers in Google Analytics. I spent some time at a workshop with Al Wightman at BrightonSEO and he went through some of the main settings and how they should be used; some of which really surprised me as I wasn’t even aware they existed. This is what is what gave me the idea to put this post together so I could share with you some information on the different settings and how and why you should be using them. 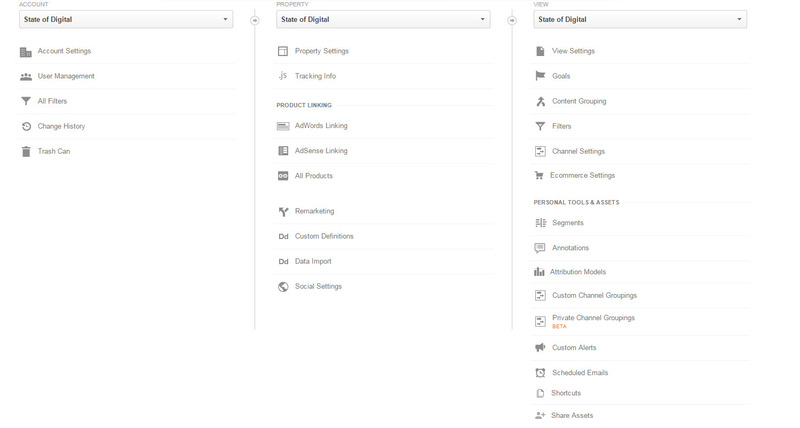 In Google Analytics, there are three main groups of settings; Account, Profile and View. In total there are 29 areas within the settings section and this post is going to explain each of them. The settings within this section will apply to your entire domain analytics account and will be filtered down to the different profiles and views that are contained within it. It is important to remember this and make sure you are happy with what you have applied at this top level. Google rely heavily on using advertisers data anonymously to help make their platform useful for others. In this section, Google give you the option to tell them what data you are happy to share. If you haven’t looked in this area for a while, you might be surprised with what you find. Website owners give different people access to their Google Analytics account from internal staff members to external agencies. This is absolutely fine and in most cases absolutely necessary but we all need to remember to remove individuals access if partnerships are ceased or employees leave the company. I would recommend setting yourself a reminder to have a look in this area once every few months and to tidy up any access for individuals who no longer need it. Giving access at this level will mean that the person you add will automatically have access to all profiles and views too. Although this sits in the top level settings area, you can create and apply filters to individual views using this. You will have different filters for different views depending on what the view has been setup to track. As with anything in Google Analytics, I would recommend testing filters within your ‘Test’ view before adding it to your live data view. If there is more than one person with access to your Google Analytics account, the Change History area can be very helpful to keep track of any main things get adjusted in your account. This way, if something happens which results in problems with your data, you can quickly look back to see what might have caused the issue. This is one of the more recent and hugely welcomed additions to Google Analytics. If you delete an account, property or view, you can restore it back to its original state within 30 days. After that, it is gone forever. The settings within this section will apply to the individual property and will be filtered down to the views within that property. This is broken down into four separate sections: Basic, Advertising, In Page Analytics and Google Webmaster Tools. It is important to understand each of them and have them set up in the right way. You need to have your Home page default URL included here so Google knows which page is your main Home page. If you have /home you should have this as the URL shown below. The second area to update is the Industry Category. Google using this information to create more tailored reporting and to provide you with more customised communication. If you want to know more about the visitors to your site from a demographic perspective, you can enable the Demographics and Interest Reports alongside the Advertising Features which you need enabled to start building remarketing lists. By default, Google will track the number of times an internal link is clicked but if you have more than one link on a page pointing to the same destination, In Page Analytics will show you the same data for each of them. With a small change to your tracking code and enabling this feature, you will be able to see data figures for each and every internal link on a page regardless of how many times it appears. Linking your Google Webmaster Tools account to Google Analytics can provide you with a lot of valuable data including to some degree, keyword data. The majority of websites using Google Analytics will be setting around 80% – 90% of keyword data being shown as (not provided) but in Google Webmaster Tools, Google are giving you a little insight into click and impression data for keywords. This data gets pulled into a Google Analytics report if you enable this feature. This area has been broken down into six separate sections. 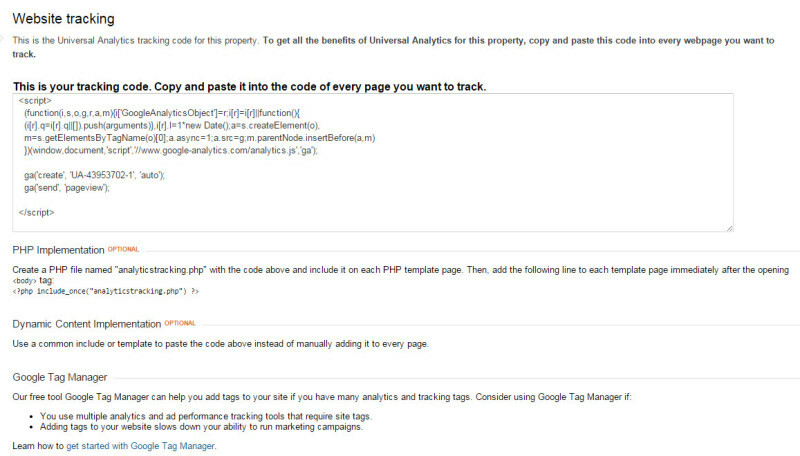 By default, Google will only give you the code for Universal Analytics. If you are still running an older version of Google Analytics, you will be forced to upgrade your code in April 2016 so it is better to get that process started sooner rather than later. If you want to know more about your visitors and how they interact with your site from different devices and browsers, you can unable User ID Tracking. This should not be done lightly though and there is a fair bit of work involved as you will need to get your developer to provide Google with that unique identifier so they can marry up your data. I would recommend that you read more on this feature here in the Google Analytics Support Centre. You can specify how long you want a user session to last for if they land on your site and don’t navigate through the pages. This can be set at session level or campaign level. If you are going to use this, use it wisely as setting it up incorrectly will mean that you potentially double up on session data in your analytics account. This setting will only work if you are using Universal Analytics. The majority of search engine traffic will appear in your reports as organic traffic but there may be certain search engines that don’t fall into the default list of search engines. If you notice referral traffic coming from a search engine that isn’t in the list, you can add it here so that your organic traffic numbers are more reflective of what they actually are. There may be certain websites that you don’t want to appear in your referral traffic reports; your own domain will ordinarily be one of those. You can exclude sites from referring traffic using this setting. On the occasion that Google do tell you what keywords are driving traffic to your website, there may be search terms that you would rather class as direct traffic. For example, people searching for your brand name or domain name are already fully aware of who you are and you may wish to add those terms to this list so that visitors are counted in your direct traffic. Within this section, you can ensure that all your Google products are linked into Google Analytics so you can share data between them. When you link Google AdWords with Google Analytics you will be able to see additional data in both platforms which enables you to make more informed decisions when managing your PPC campaigns. 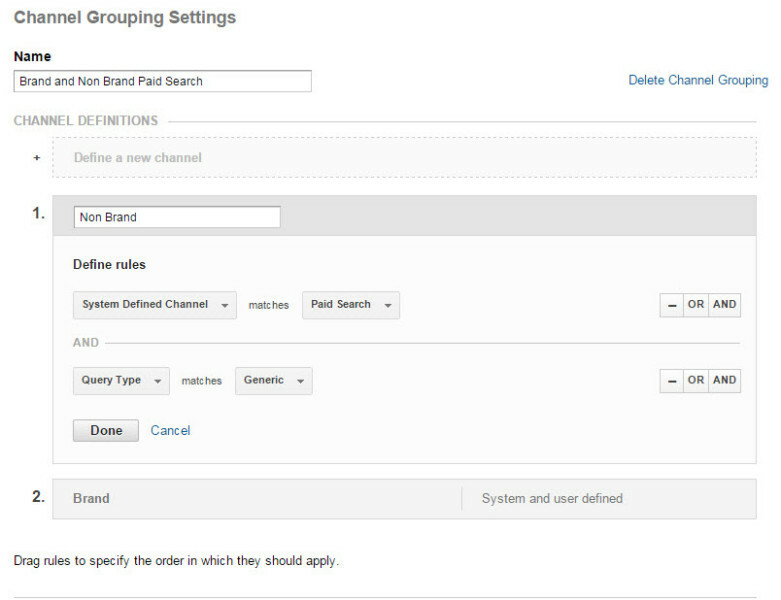 There are two setting sections within the remarketing area: Audience and Dynamic Attributes. What lists you create will very much depend on your business and the goals and objectives you are working towards. 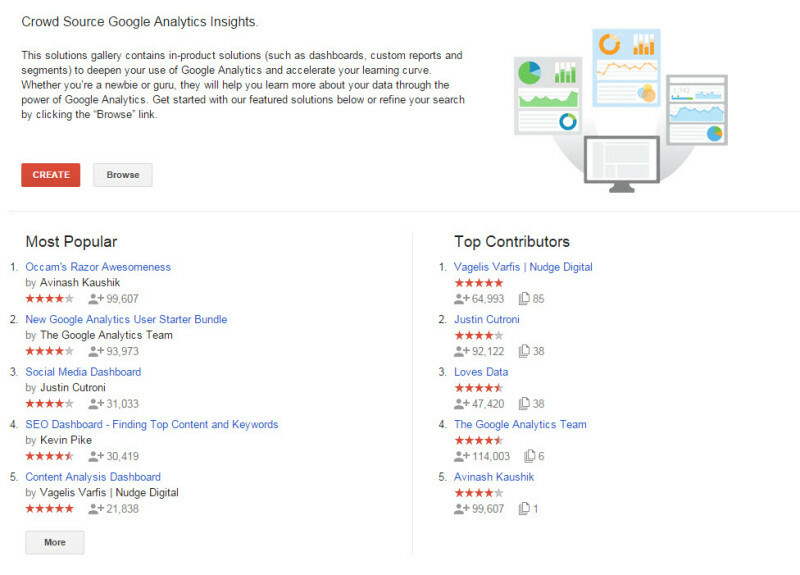 If you are just getting started, there are hundreds of lists in the Google Analytics Solution Gallery. This is a feature that works brilliantly with remarketing and it allows you to enhance your campaigns with dynamically created content and really tailor the ads to the audience and their interests. There is some work involved as you will need to make some changes to the code on your site but once that is done, you can get very creative with your remarketing campaigns. For example, if someone has stumbled across your site and viewed a particular product, hotel, flight etc you can dynamically create adverts that include exactly what that person viewed and try and entice them back into your site to convert with a special offer or deal. In Google Analytics, all the data is based off of metrics and dimensions. 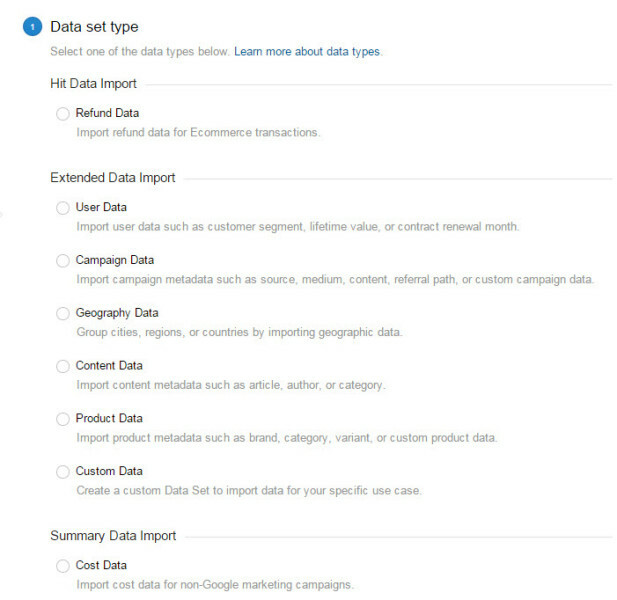 In this section, you can create custom definitions for both dimensions and metrics so you can collect and analyse data that Google doesn’t automatically track for you. There is an element of coding involved so if you are not techy, you may need to enlist the help of a developer to do this for you. You can have up to 20 custom dimensions and 20 custom metrics in your Google Analytics account unless you have Analytics Premium, this then increases to 200 of each. At present, Google Analytics can only link up with other Google properties but there may also be other valuable data that you would like to import from other platforms. There are some examples in the screenshot below that shows you the type of data you can import. One of the more popular data imports is refund information for product sites so you can see a more accurate sum when looking at the ROI for campaigns. Additionally, cost data from other marketing platforms such as Facebook and Bing can be imported so you can use Google Analytics to analyse cost vs. return from your paid marketing campaigns. This is where things really get interesting and there are a lot of options available to you which a lot of advertisers are not taking advantage of or may not be aware of yet. Any settings applied at this level will impact the individual view you are looking at and only that. They will not be transferred to the entire profile. This is one of the main areas that I feel is under-utilised when it comes to the view level settings. If you are going to have multiple profile views setup, it is important to think about the naming convention so that you can easily know what each profile is for when you come back to look at them in the future. In order to be able to use the time of day reporting in Google Analytics properly, make sure you set your time zone when you first create the new view. If your Home page defaults to something that isn’t just the domain (e.g. www.example.com/home) you will want to include that in this area here. Lots of websites use various tracking elements that create hundreds if not thousands of different URLs that are purely used for tracking. For example, at Koozai we use Infinity Call Tracking on our paid search campaigns but it means that for every keyword in our PPC campaign, we have different landing pages. In Google Analytics, these will all show up as different pages which in theory isn’t correct. There is actually only a handful of actual pages; the rest of them are those pages PLUS the UTM tracking appended to the end. Using this setting, you can instruct Google to ignore all the tracking pages and merge all the data for the actual page together giving you more accurate and useful data for the individual landing page. In the example below, I have told Google to ignore all URLs that have infinity within them and lump all that traffic into one. This should match the primary currency that you are interested in. This will not be ticked by default and if left unticked, your traffic numbers will be inflated as you will not be excluding any known bots from being counted as visitors in Google Analytics. Google are aware of a number of known bots and ticking this box will exclude any of that ‘fake’ traffic from your account. If a website has a site search, you can learn hugely valuable data from what visitors to the site are searching for when they arrive on site. Are there products that are searched for that you don’t currently offer but could? Are people finding it hard to get to what they are looking for on-site? Is there enough demand for information that it warrants its own section on the website? These are all questions that can be answered if you have a site search facility. But, just having the feature isn’t enough. You need to be able to track what people are using for it for and what they are searching for. Simply switching this option on and pulling in what triggers the search feature to work from the URL, you can get all this data and more in your Google Analytics reports. In the above example, you can see that I have switched the setting on and the trigger for the site search on the Koozai site is ‘s’. This should be used in the same way as I described in the Account Level Settings but whatever you do in this area is applicable to the View you are in only. One of the most important things about Google Analytics is being able to track the performance of your website against the core business goals and objectives. Typically, when you have a website you will more than likely want someone to do something when they arrive on site. Whether that is buy from you, get in touch, download a brochure or read a certain article, there will always be a goal. Creating a goal is pretty simple and there are templates that you can follow or you can create your own. I have only just started using this feature and I am totally hooked! It does what it says on the tin really; allows you to group together content on your site so you can analyse the performance of sections on your site rather than just individual pages. Blog & TV Sections: Our Blog and TV area on the site contains content based around six core topics (SEO, PPC, Content Marketing, Brand, Social and Analytics). Using Content Groupings, I can see which is the most popular topic for our site and create content based on that. This is then pulled into the Content Groupings report in Google Analytics. Below you will be able to see how this is set up for the Site Sections grouping I mentioned above. If you have already set up Account level filters, you will see them listed in this section (as I described towards the beginning of this post) but at View level you can also create individual filters specific to that view. For example, you should have a view that excludes all your internal traffic; this is where this would be set up. If you are wanting to exclude a bot (that Google doesn’t automatically detect), this should be done at the Account level. There are two core areas to this setting; Channel Grouping and Manage Brand Terms. Google have set channels that they use to define where traffic comes from but there may be others that you wish to group together to make analysing the data easier. 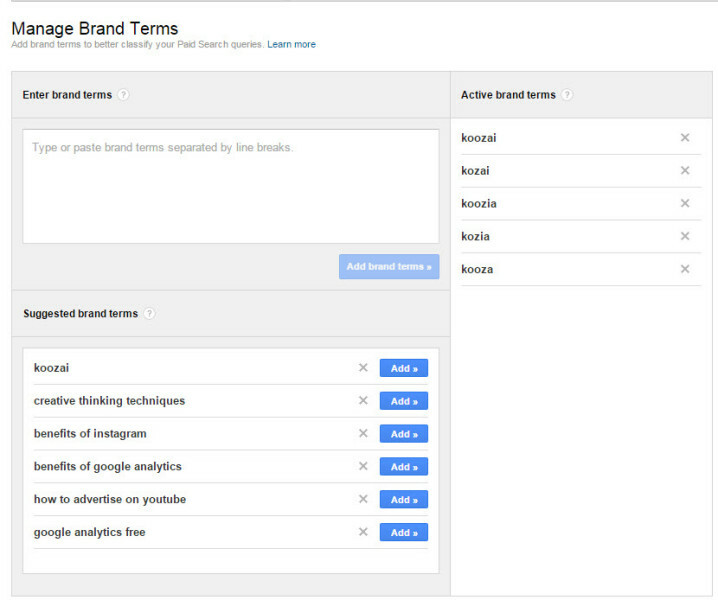 If you are running a paid search campaign that includes your branded terms; you should use this section to create a separate report in Google Analytics so when you are analysing your paid search campaign performance, you can break it down into brand and non-brand keywords. Let’s look at each of those and how you should go about setting this up. 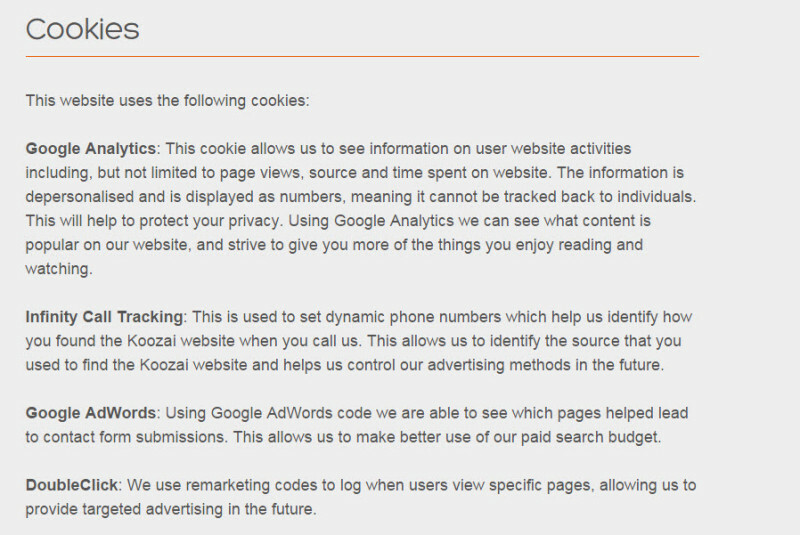 The screenshot below shows you an example of some of the brand keywords that people might use to find the Koozai site. You will notice that I have also included lots of misspellings. You can find all the common branded searches in your search query report in AdWords if it is already running. Once you have the keywords in place, you will need to set up a Channel Grouping; brand and non-brand paid keywords. When you add the keywords, Google will automatically create these for you but it is important that you check the setup has been done correctly. I would also suggest that you move them into a new channel, as Google sometimes adds them into the default area. In 24 hours, you should be able to see the data in your Acquisition Reports in Google Analytics. If your website sells a product, you can get Ecommerce tracking setup which allows you to be able to see a lot more information about sales that happen on your site including products sold and revenue. You may need to enlist the help of a developer to do this for you if you are not comfortable editing code as there is an element of this involved in the setup. If you are using Google Analytics and you are not using Advanced Segments you are missing out on so much data it is unbelievable. 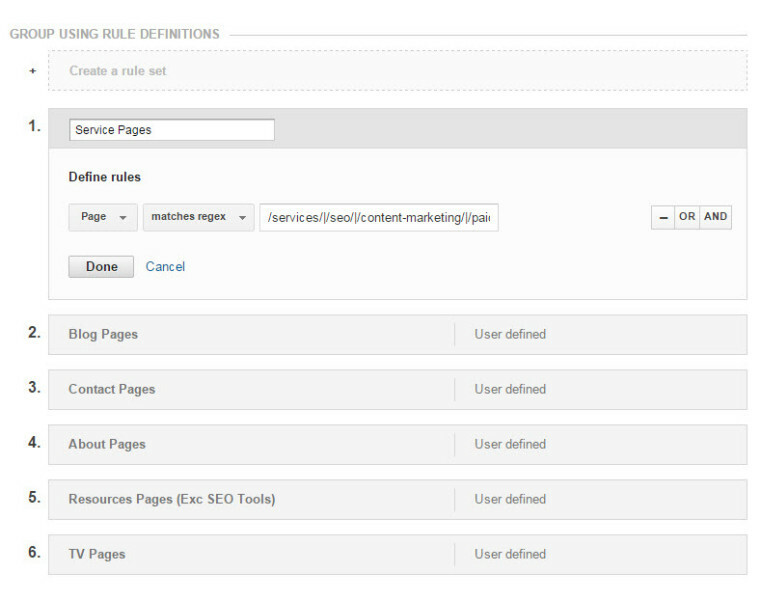 Analytics lets you segment data but certain segments but using custom segments, you can create your own. For example, you might want to see how your site performs with visitors who are using an iPhone. This can all be done in segments. You can either create segments in this area or directly within the main reporting area. The latter is probably the easier of the two and I would use the settings area to manage, share, copy or delete a segment. If you make a change to your website or your Google Analytics account or you just want to keep a note of something memorable that happened in your industry that could potentially impact your site traffic, you can use Annotations to do this. As with segments, there are two ways of doing this; either in the Settings area or from the main reporting area itself. This is what you will see if you navigate to Annotations within settings. The list will continue to grow the more annotations are added. It is useful to look here if you want to see an overview of everything that has been added. You can also add a new one from here too. Underneath each of the graphs, you can click to add a new annotation or view the annotations that are for that time period. This is the area that you need to use to create an Attribution Model for your site. It allows you to tell Google what is most important when it comes to conversions and the paths and channels used by your customers prior to them completing that conversion. There is so much to talk about when it comes to Attribution Models and this post isn’t the right place for that. If you want to read a little more, I would suggest looking at the Analytics Support area first followed by reading lots of posts about how different models could work for you. This is a very useful tool that allows you to create alerts if certain things happen to the traffic on your website. An example of a Custom Alert is shown below which will inform me if the organic traffic to the site drops 20% when compared to the previous month. 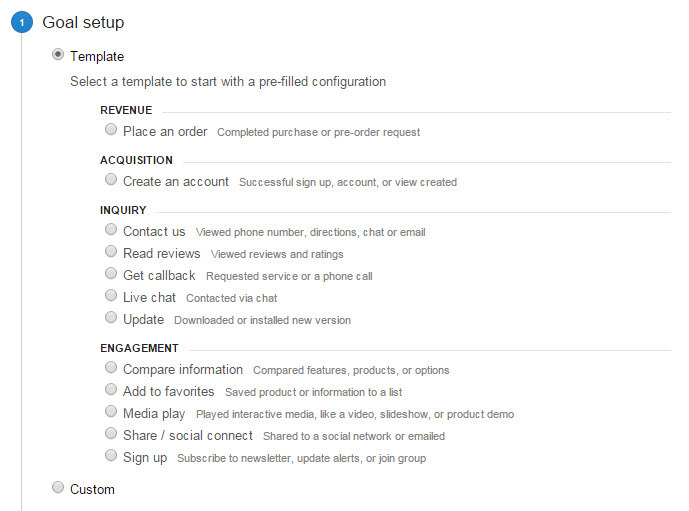 You can set up reports in Google Analytics to be emailed to either yourself or others on a regular basis. This is done within the main reporting area of the tool but if you want to stop any of the emails, you will need to go to the Scheduled Emails setting to do this. If you are like me, then there will be certain reports that you always use when you login to Google Analytics whether they are standard reports or custom reports that you have set up yourself. Saving your most used reports as a shortcut allows you to navigate to them very quickly as they are all stored in the one place. When you are in the main reporting area you will be able to get to Shortcuts from the side navigation or you can access them from within the settings of that view. When you create goals, custom reports, segments or groupings, it can be very useful for not just the one view or profile but for others too. 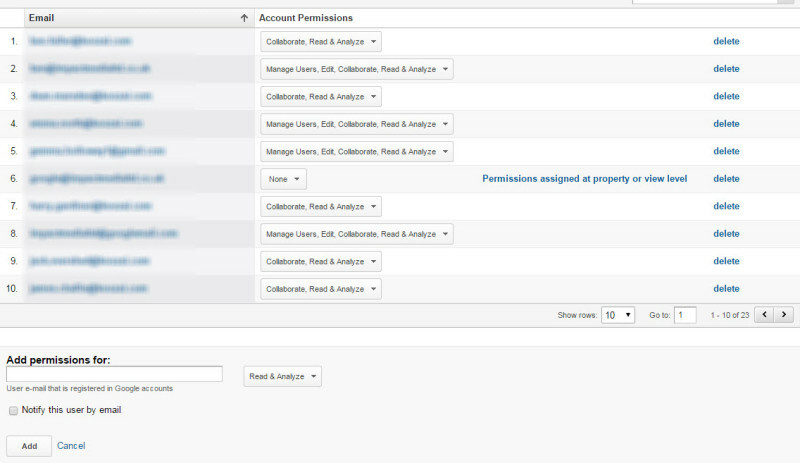 In the Share Assets area of Google Analytics, you can do this very easily. Whether you want to share the asset with another person or profile or upload it to the Solutions Gallery for everyone to use, this is the place where that happens. 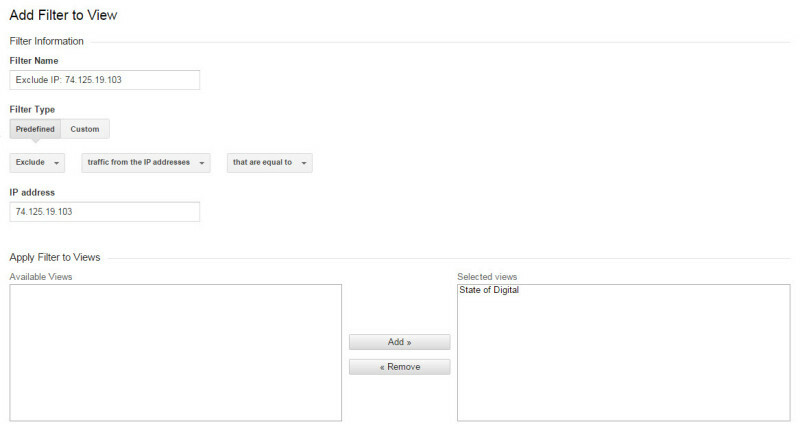 That is the final setting available to you in Google Analytics. I hope you have found this post useful and learnt a few things that you can do with the settings. Will The Return of Tweets to Google Impact Online Reputations? Thanks Charles. Really glad you like the post. Just had a look through your slides, very interesting indeed. Thank you for sharing! Content Grouping, just started with this. Very intresting part of Analytics! Further this article describes okay how to setup Analytics. Thanks for the post. Excellent article! I went through quite a few posts to understand the setting up of GA, but, this one really takes the cake.. Thank you very much.